Traded the Cruze in today! 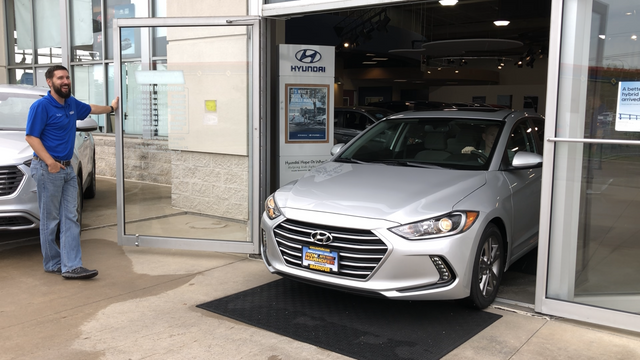 Drove a brand new Elantra Value Edition with 14 miles off the showroom floor: sunroof, dual zone climate, Apple Carplay, push button start, LED's, blind spot monitoring, rear cross traffic alert, backup camera, auto dimming mirror, heated front seats, and the 2.0L NATURALLY ASPIRATED engine. I LOVE this car. LOVE it. Drove over an hour for this thing to get a killer price and it had killer rebates, 5k off MSRP. On my drive home, I couldn't believe my eyes when I pulled into my driveway, 44.7 MPG. Guess I'm the new NickD? Last edited by sparkman; 06-09-2018 at 11:52 PM. obermd, jblackburn, Sunline Fan and 5 others like this. Congrats on the new purchase. Hyundai isn't known for it as much as the domestic brands, but they offer a lot of great incentives. I regularly drive a lot of compact rentals when traveling for work and even the base Elantra has improved greatly over the last couple generations. jblackburn and sparkman like this. sparkman and Rivergoer like this. I drove a Hyundai Sonata for 10 years before buying my Cruze. It was a good car. Hiding somewhere among the tall, blue grass. Boo! Hiss! There lurks a spy among us! All joking aside, I'm glad you like your new ride and I hope it does well for you, Sparkman. Sunline Fan and sparkman like this. Congrat.u.lations. Well, that’s certainly ONE way to eliminate the gas stench, extreme but effective. Time to close-out @sparkman ‘s Build thread and enjoy the new Hyundai. May you have many trouble-free miles ahead and hope to keep seein’ you around CT.
obermd and sparkman like this. You don't babble enough about 50 year old automotive technology. jblackburn, Sunline Fan, jmlo96 and 1 others like this. Is this why we didn't see you at Lordstown?